Blowout Sale! Save 65% on the Keigo in Modern Japan: Polite Language from Meiji to the Present by University of Hawaii Press at Translate This Website. Hurry! Limited time offer. Offer valid only while supplies last. Patricia Wetzel offers in this volume a comprehensive examination of a frequently discussed yet much misunderstood aspect of the Japanese language. 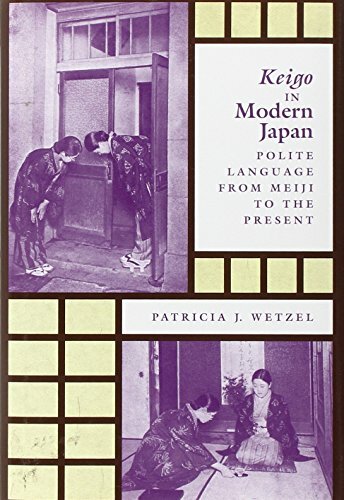 Patricia Wetzel offers in this volume a comprehensive examination of a frequently discussed yet much misunderstood aspect of the Japanese language. Keigo, or “polite language,” is often viewed as a quaint accessory to Japanese grammar and a relic of Japan’s feudal past. Nothing, Wetzel contends, could be further from the truth. It is true that Japan has a long history of differentiating linguistic form on the basis of social status, psychological detachment, emotional reserve, and a host of other context-dependent factors. But, as is made clear in this unique and broadly framed study, modern keigo consciousness and keigo grammar emerged out of Japan’s encounter with Western intellectual trends in the mid- to late nineteenth century. Keigo in Modern Japan presents a finely nuanced linguistic and political review of keigo available nowhere else in English. The first chapter outlines the ways in which keigo has been problematized in Western linguistics through the application of structuralist analysis and its offshoots. But keigo’s presence in the English-language literature does not begin to compare with the place it occupies in the Japanese linguistic canon. Wetzel describes the historical roots and growth of keigo and the popularity of how-to manuals, which, she contends, are less about overt instruction than reinforcing what people already believe.